Making your own wire frames for beading opens up all sorts of design options. And the best part is that it's very simple! For the most part, you can do it with basic wire working tools - although like everything else, it can be done more quickly with a couple of specialty tools. These instructions will show you how to make a U shaped wire bead frame. Once you have made the frame, you can follow these instructions to wire beads to the frame and make a pendant necklace. I used 3 inches of 20g red brass wire to make my bead frame. You can probably use almost any type of wire as long as it will hold its shape well. A soft wire like aluminum is probably not the best choice for a wire beading frame. Sterling Silver (plated and filled too), gold filled, copper and brass are all good choices for this design. There are two options on how to make the wire frame. The first way is to cut the wire, then make a simple open loop and the end of each side of the wire. Make sure the loops are on the same side of the wire. I used my 1-step looper tool to make the open loops. It is just as easy to do with round nose pliers - I just like to use my tools when I can! To make the horseshoe or U shape, push the wire around a round mandrel. I am using a plastic step mandrel from Beadsmith on the step that is about 1 inch in diameter. You can use any firm smooth round object that is about the same size. A bottle of nail polish is probably a good choice. Make sure the open loops are facing up while you wrap around the mandrel. This can be a little tricky, since it may slip or turn while you are wrapping. You can always twist them back to the right position after shaping the wire. Depending on the amount of spring in your wire, the shape may end up a little larger than what you are wrapping it around. With the step mandrel, I can wrap a size smaller and then re-shape it on the step that I want the final size to be. Once the wire is shaped, remove it from the mandrel and adjust the loops and shape as necessary. If your wire is soft and doesn't seem to hold the shape well, you can hammer it to harden the wire. Refer to this article for more information on how and why to hammer wire. You can also make the U shaped frame first and then add the wire loops if that is easier for you. Using the same size wire, about 3 inches, wrap the wire around the mandrel. Don't make a complete circle though - you can stop when you have an exagerrated U shape. 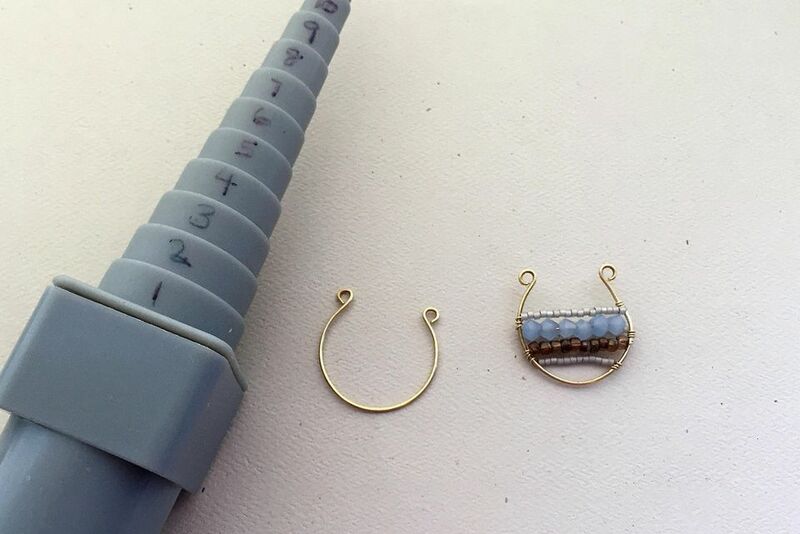 Remove the wire from the mandrel and add open loops to the ends using your round nose pliers. Decorate the bead frame by adding beads using wire or thread. Follow this step by step tutorial to decorate the frame by wiring on beads and making a decorative chain to match. Wire bead frames are very versatile and easy to make in a variety of shapes. Follow these instructions to make a diamond shape wire beading frame, or a wire heart bead frame, or these instructions to make different Christmas ornament shaped beading frames.